The coldest temperature in the winter of 2010-11 was -37° Fahrenheit (F) at Ladysmith 3SW (Rusk Co.) on January 22, 2011. 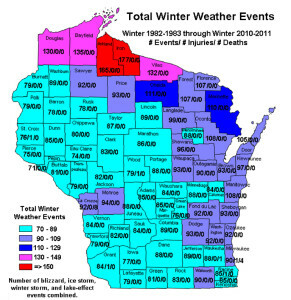 The Hurley, WI–Ironwood, MI, area in Iron County had the most snow of 167 inches in the winter of 2010-11, while Waunakee in Dane County had the least with only 37.2 inches. Most of the northern two-thirds of the state had 60 to 95 inches, while the southern third had 40 to 60 inches. The 92.6" in Green Bay during the '10-'11 winter was the highest amount in modern-day history. Only the winters of 1889-90 and 1887-88 had more snow. Wisconsin's all-time, lowest temperature is -55°F on February 2 & 4, 1996, near Couderay (Sawyer Co.). Readings of -30°F or colder have been recorded in every month from November through April. Of course, brief readings in the 50's, 60's and 70's are possible during winter as well! Average annual snowfall ranges from 35 to 40 inches near the Illinois border to 135 to 165 inches in the Iron County snow-belt from Gurney to Hurley. Greatest daily total – 26.0 inches of snow, at Neillsville on Dec. 27, 1904, and Pell Lake on Feb. 2, 2011. Greatest single storm total - Superior, 31.0 inches over Oct. 31-Nov. 2, 1991. Greatest monthly total - Hurley, 103.5 inches in Jan. 1997. Greatest seasonal total - Hurley, 301.8 inches in winter of 1996-97. Deepest snow on ground (excluding drifts) - Hurley, 60.0 inches on Jan. 30, 1996. IRONWOOD, MI - Friday, December 17, 2010 - An article entitled "America's Top 10 Snowiest Cities" by Jonathan Erdman, Editorial Meteorologist for the Weather Channel, named Ironwood as the tenth snowiest city in America. According to the article, Ironwood has an average yearly snowfall of 164.6". Our snowiest month is January (40.2"). And our snowiest day in recorded history was 24" on December 16, 1920. The largest record depth was 81" recording on December 12, 1904. "Ironwood, MI, and its twin city on the Wisconsin side, Hurley, not only reside in a northern location more prone to cold and snow, but also just 18 miles south of Lake Superior." "Cold north winds pick up moisture off the nearest Great Lake, adding to snowfall totals from a winter storm ('lake enhancement'), but also in the absence of a nearby storm ('lake effect')." "Locals revel in outdoor recreation. There are five downhill ski resorts, and hundreds of miles of snowmobile trails in the area." Hancock, Michigan made it to #3 on the list, showing an average yearly snowfall of 218".